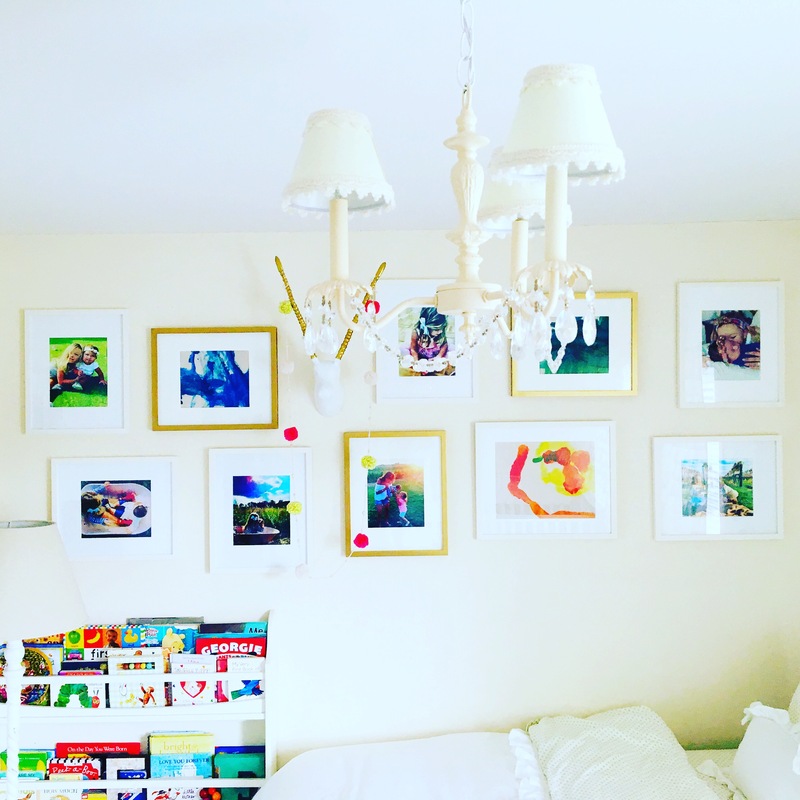 Gallery walls can be intimidating and overwhelming, and that being said, you might leave a good chunk of open wall space blank just because the alternative task of actually buckling down and creating a gallery wall there is too daunting. But in kids’ rooms, as opposed to a more formal living room, there are no rules, no boundaries. And that’s why it’s a great place to start. 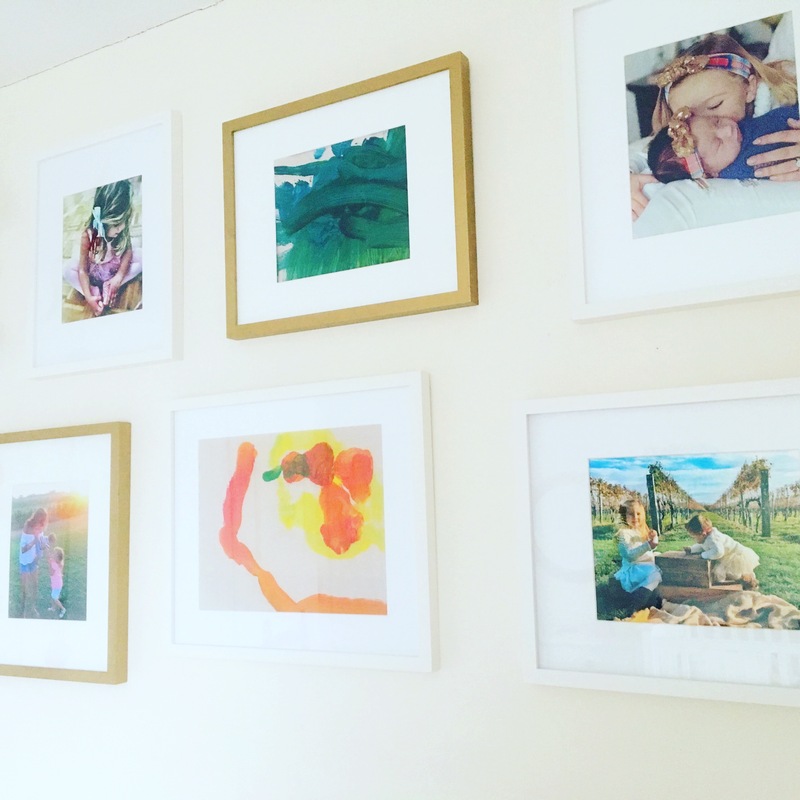 Chances are you have a ton of photos of your kids that need to find a spot in your home anyway, and plenty of handcrafted artwork from their classrooms or home projects. And as a mom, priceless fine art simply can’t hold a candle to those smudgy broad strokes, those messy, finger-painted masterpieces. 1. I like to start with a combination of photos, artwork and other wall decor, so that there is a fun smattering of stuff across the wall, and not the same exact piece seen throughout. You can start at the wall, but I prefer to start on the floor and lay everything out as I think I would like it to appear. 2. Then, I take a few photos with my phone, so I can review and get a good look at how I may want to rearrange the layout. This is where you can get creative: you can stick to plain, straight lines, play with pattern, or just place them at random. 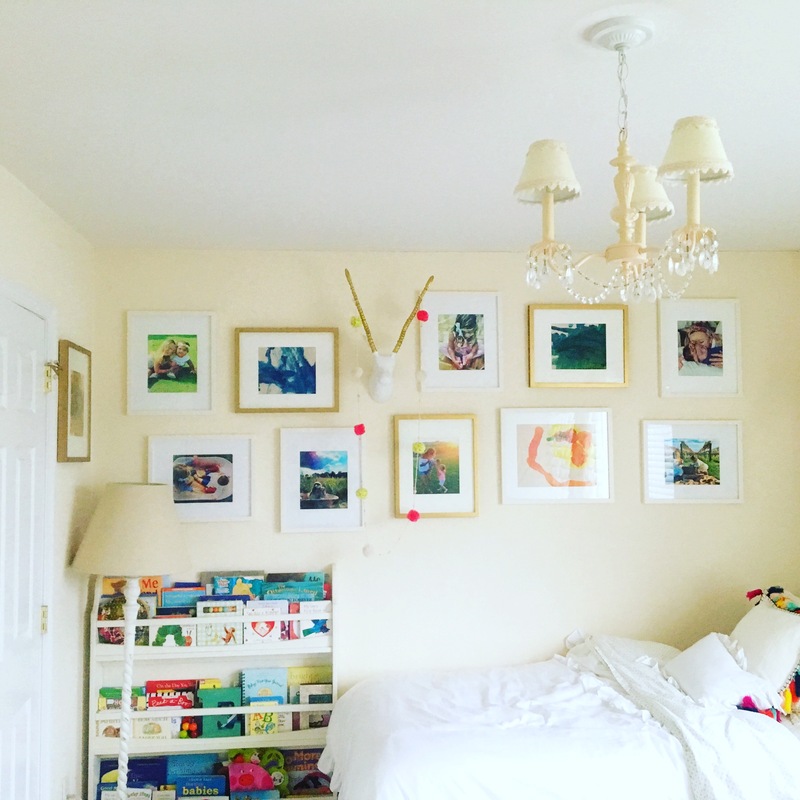 Keep in mind that balance and symmetry do help to create a more fluid gallery wall and you don’t want the layout to get so crazy that it ends up looking messy, so try to have the overall pattern balanced against a certain piece of furniture, centered in a room or spread from one end of the wall to the other. 3. Once I have settled on a layout, I put pencil marks on the wall where I want the frame to hang, taking into account that there will be additional space when using wire to hang your frame as it droops. 4. I like to keep the frames about 3 inches apart from each other no matter how I choose to arrange them. This gives enough room around each piece to be able to really enjoy it. You don’t have to run out and buy a ton of new frames to embark on this project. Take a look at what you already have around the house and possibly in storage that isn’t being used anymore and see how you can use them for your gallery wall. For example, I had a bunch of cream-colored frames from Emma’s nursery when she was a baby that I had taken down when I transitioned her room and brand-new, bright white frames that we had gotten for Reese when she was born two years later. I decided to stick with the bright white ones for the majority of the frames, and spray painted the old ones in an antique gold. This way, I got to recycle old frames that weren’t getting use anyway and I really liked the finished product with a mix of white and gold. Not everything has to match spot-on. 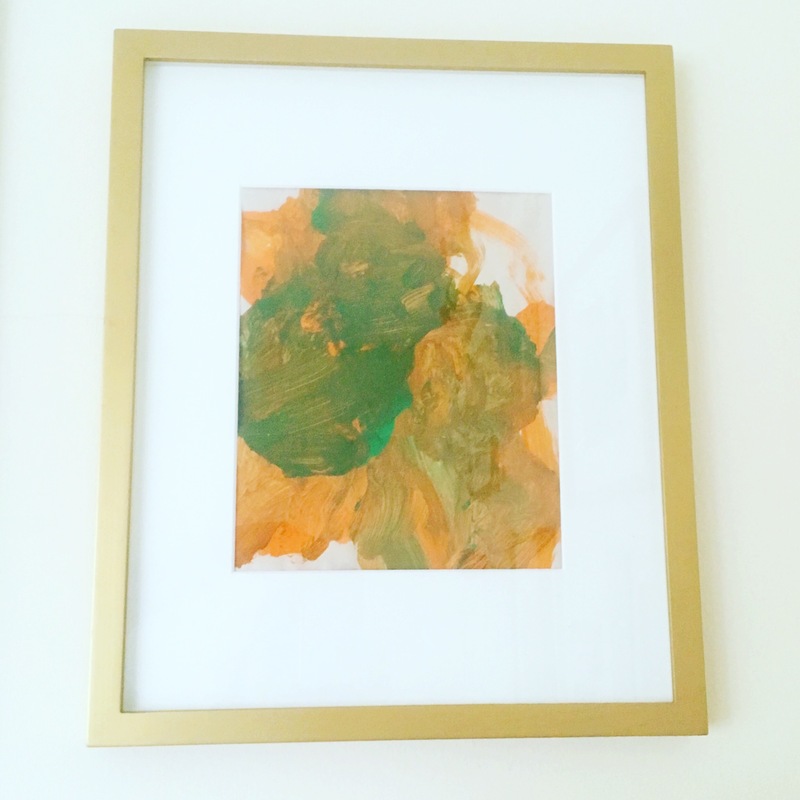 In fact, things tend to look so much better when different shades of the same hue are used, so try to frame photos or artwork that go with the overall theme or color trend of your child’s room. In our case, Emma’s room, as she has gotten older and gained more of an opinion of her likes and dislikes, has evolved into a really fun and colorful room. 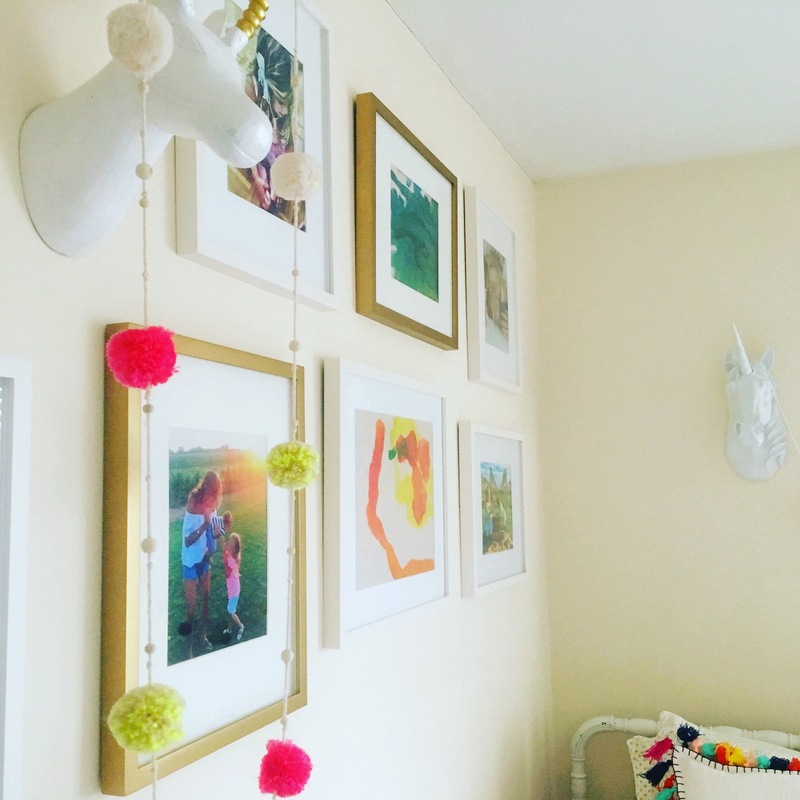 A stark contrast from the white, beige and pale green nursery she started out with. 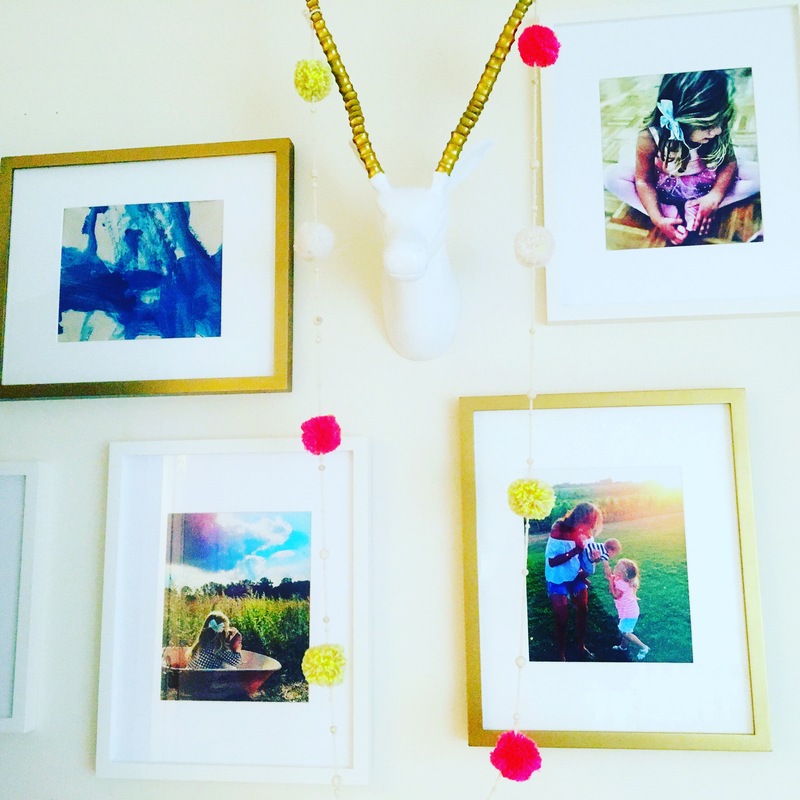 So, I used a few strands of colorful fabric garland and chose the most vibrant photos and flashiest finger-paints for her gallery wall. Love it. So creative, fun and personal! This is really nice! Especially with the paintings. It makes it personal and your kid would love to see that you like their art so much! However, instead of photos, I always tend to hang some nice illustrations on the wall to keep it a bit less cluttered.